Diggers Valley: 3 October 2015. The week beginning the 3rd of October 2015. As I pulled on warm clothes at 3.30 this morning, there was a sudden heavy downpour. Fortunately, for the fifteen or so minutes I was outside walking around in the dark, checking on my pregnant heifers, the sky was clear. Nothing was happening, so I went back to bed. So began my week of cold motor-bike rides at first light, out around the pregnant mobs, checking rear ends for any signs of labour commenced but arrested by trouble, hands aching from the unusually low spring temperatures. I go out in the early hours only if one of the two-year-old heifers is showing signs of being near calving. 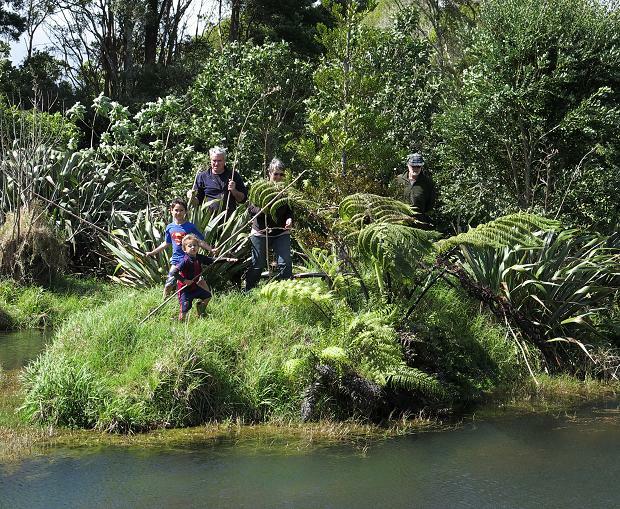 Elizabeth and William brought their school-holiday-resident grandchildren, Kerehoma and Maihi, out for a visit. On a tight deadline, I stayed home writing while they all went up the road to check on the orchard. The island is a fun place to visit at any time of the year. Floss spent an hour or so in the apple tree by the pond. While I could see her from the house, I left her to it. When she disappeared, I went to check and found her wandering around by the jetty. Looking for a boat out of here? Gem's daughter. 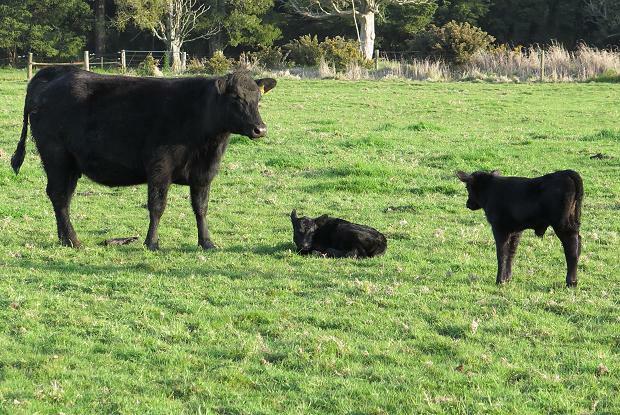 Having watched last year's late-born steer calf rocket away in growth to catch up with the others, I have high hopes for this calf, as long as she turns out to be quiet enough. 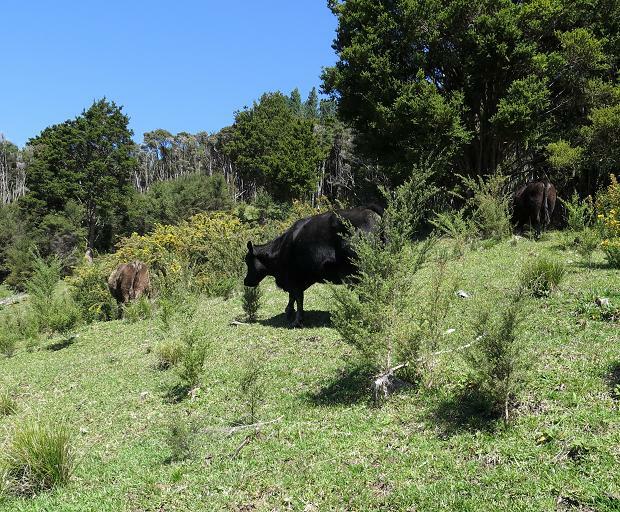 Despite their quiet mother, 545, the twins are not calm cows and they're passing that trait on to their calves to some extent. This one's sire, 128, was a quiet little bull when he was small and a relatively easy yearling, so hopefully we're heading back in the right direction again in terms of temperament. 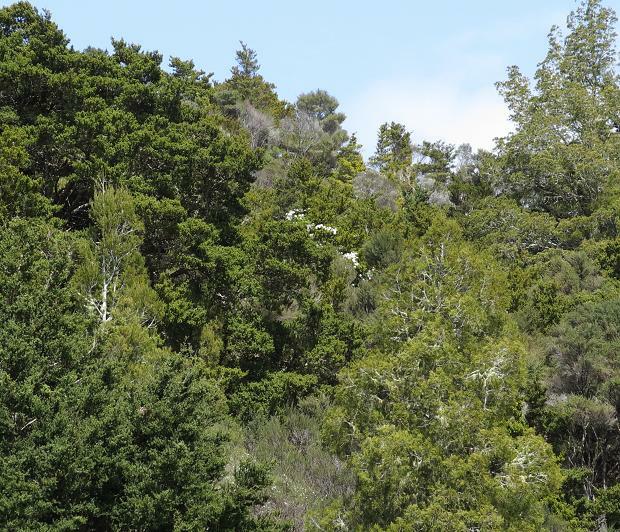 The reserve Over the Road continues to thicken with new growth. It seems a lot of seedlings have suddenly had a growth spurt, making their presence more obvious than before. 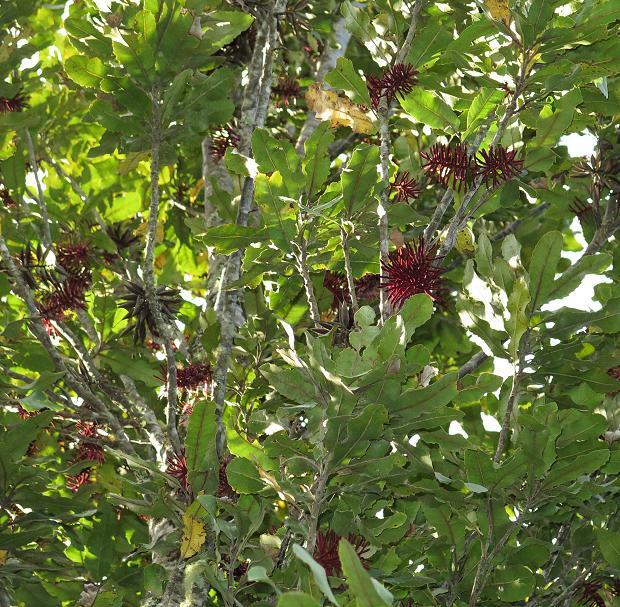 There are lots of Taraire, Puriri, Rewarewa, Pigeonwood, Nikau and Hangehange. Mother and daughter, 475 and 606, are still both in one piece at the bottom end of the Windmill; Eva and 607 are working their way down from the top. 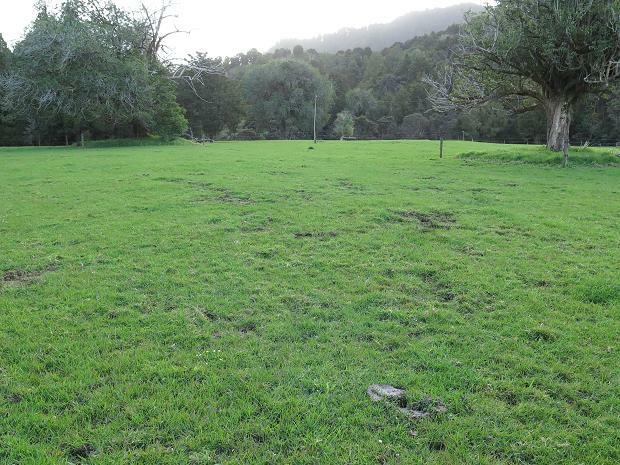 In the corner of the paddock to the right of the photo, is an ever-diminishing square of fresh grass. 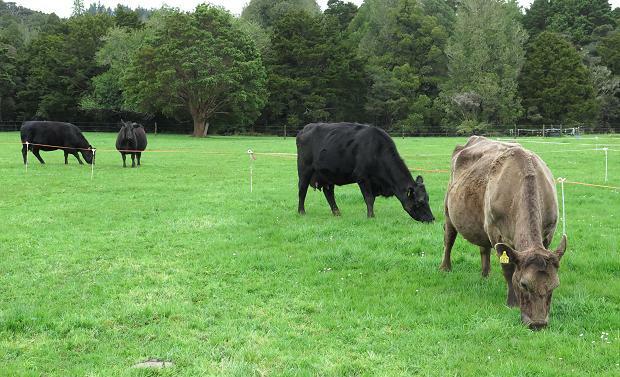 There's not much more in Flat 1 where the heifers are grazing their way up the paddock, so that the next break is barely distinguishable from the area they've just finished. But it's fresh growth, keeping them going. September's average temperature was colder here than it has been in any year since my records began in 1995. While the average minimum temperature was cool but not exceptionally low, the average maximum was only 13.9°C, compared with the long-term average of 17.0°. Stephan left me alone with all these worries and went fishing with Terry, his trapping co-contractor. I came out and checked on Erin 132 at 3.15 this morning, suspecting she was getting close. 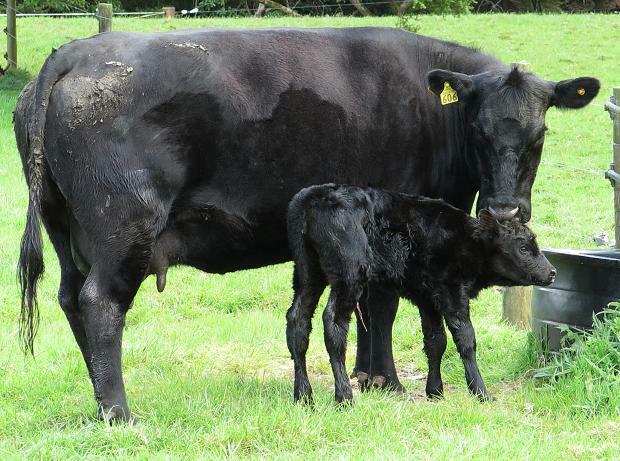 But she didn't start showing signs of labour until around 9.30 and calved just before 11 o'clock, with a little help from me since she was looking a bit tired; a bull. She sat like this, with her mouth open and tongue out, for several minutes. 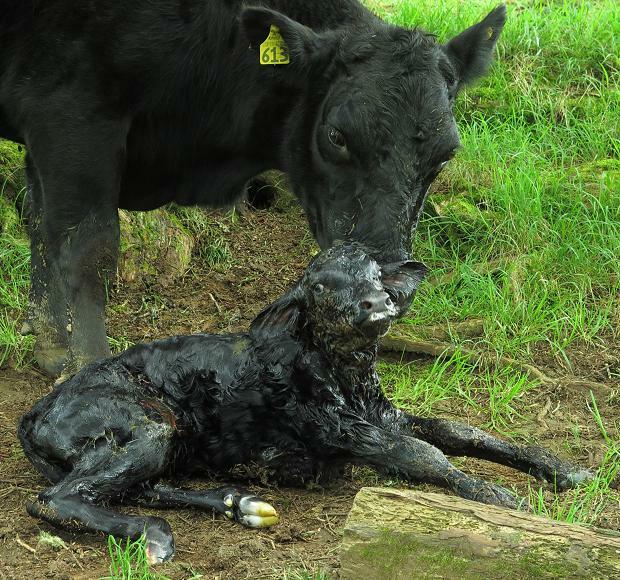 The calf was fine, with his face clear of the membranes so he could breathe and it wasn't until he started moving to get up that she rose, turned and began cleaning him up. Clematis flowers are gradually appearing where the vines are growing in the trees. Some have disappeared from usual spots, but there are others in places I've not seen them before. 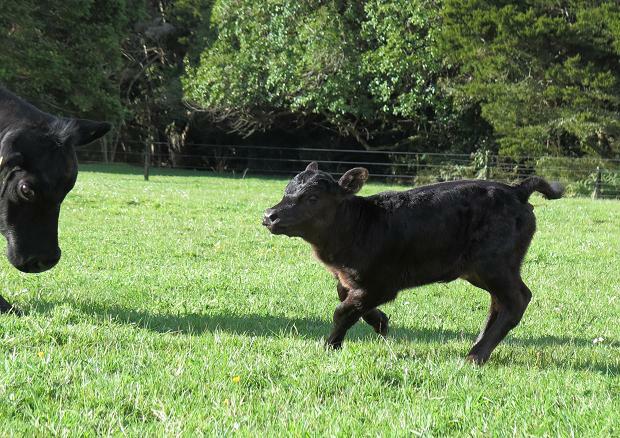 Having been the lone calf in the mob for a week, 745's son came to investigate the new arrival. These encounters are amusing to watch and I often stop and do just that. Gem's daughter again, already starting to look reasonably solid. I'm probably tempting fate by making her an early favourite. I thought Eva had a couple of days to go before calving and she certainly didn't look as though anything was going on when I gave the cows their Magnesium and Molasses at 6.30 this evening; but upon my 10.30 check, I heard the low "new mum" moo from the end of the paddock and there found Eva with her tiny daughter, all cleaned up and having had her first feed. She must have been born around 9.30. 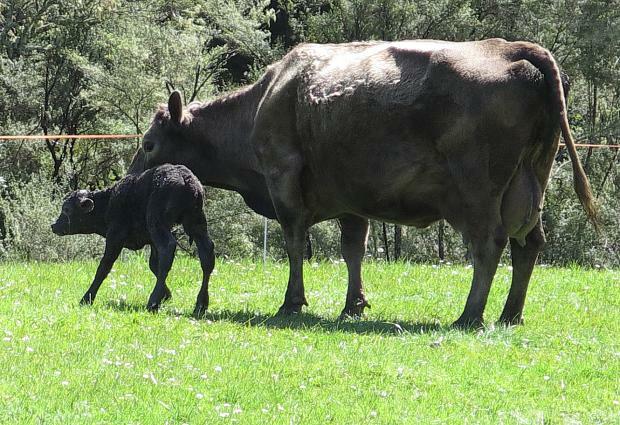 And so the Eva's Calving Date Competition is resolved: Megan from Martinborough has won; Congratulations, Megan! While she says she'd like to take up the farm-stay option, Martinborough is a long way from Diggers Valley, so Megan has opted for the magazine subscription as her prize. "Shall I get up and run away? Is that creature dangerous?" Eva's daughter, not quite sure what to do when I crept in for a close look at her early this morning. She's a tiny wee thing. 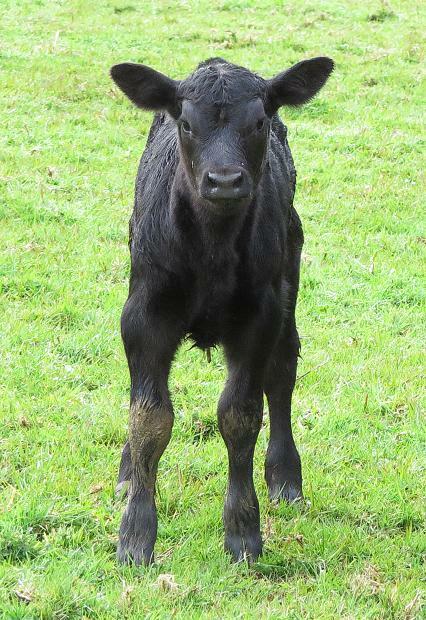 Little calves always get up and down like this because their rear ends are much lighter than their head and shoulders. 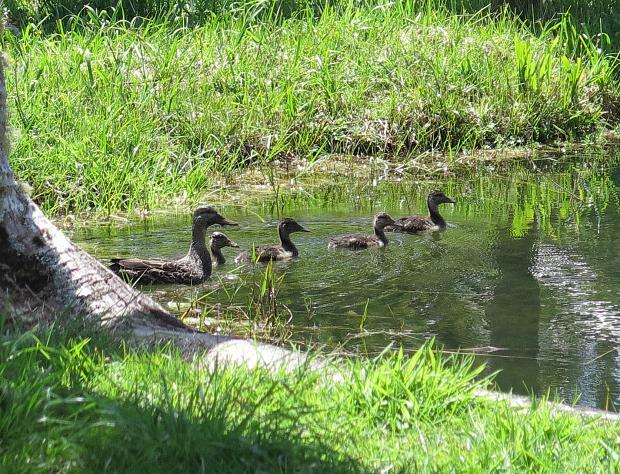 This Mallard duck has been appearing with her ducklings for the last week or so, but rarely close enough to photograph them and usually moving so quickly that they disappear as soon as I spot them. This morning I managed to sneak down to the pond while they were walking through the long grass, so they didn't see me coming. I've been putting Floss in the lemon tree, which she seems to enjoy. 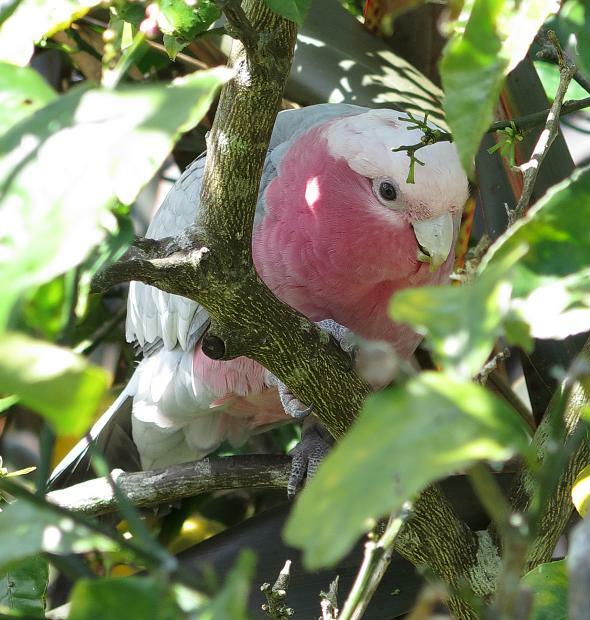 She has sufficient cover to be safe from the hawks I imagine might like a pink snack and close enough to the house to make her own way back if she chooses to. When I retrieve her she smells all lovely and lemony. I don't know if she's doing any damage, but the tree needs pruning anyway. 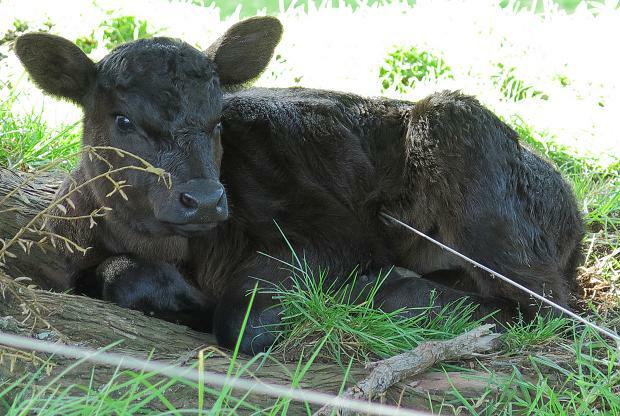 475 finally delivered her calf, a bull, this morning, after escaping under the electric tape and disappearing into some blackberry bushes still growing in the dip in the Windmill Paddock. 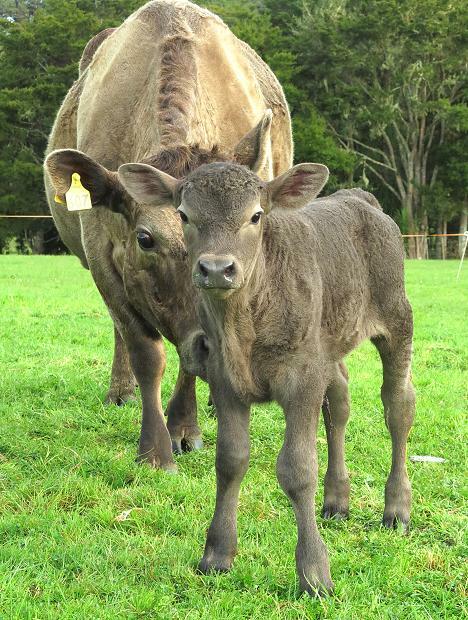 Soon afterwards, grey 607 began her labour and produced her sixth grey bull calf! I'm so pleased she had the lovely Jet 777 last year, or I'd possibly feel just a tiny bit disappointed. 607 has been such a productive cow and I'm hoping she might have another daughter sometime. This was a disturbing sight! Eva's calf run-through by a piece of fence wire ... until I realised she was only lying across the bottom wire of the fence. I couldn't imagine it was a comfortable position, nor particularly good for whichever internal organs were being squished, so gently urged her to get up. While checking the cows each evening a pair of Spur-winged Plovers fly around screeching their alarm at my presence. On the ground, somewhere in the dark, I have been hearing the plaintive peeps of their tiny, cold chicks. This evening I found them, so I picked one up for a close look and a warming cuddle in my hands; they're very sweet little things. What a beautiful day, fine, sunny and warm all day long! 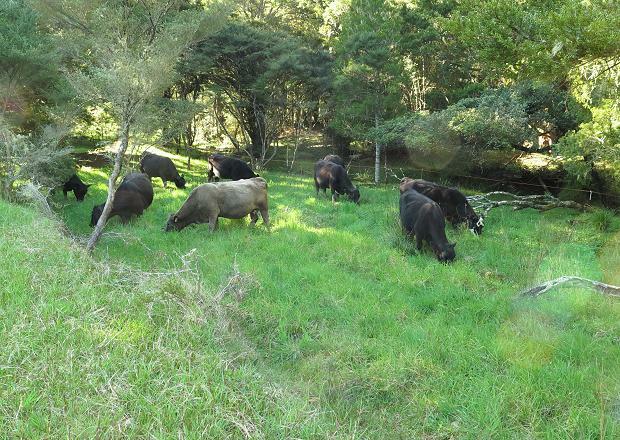 I went to find the six cows in the PW and discovered them sitting in the shade or grazing quietly on the hillside. 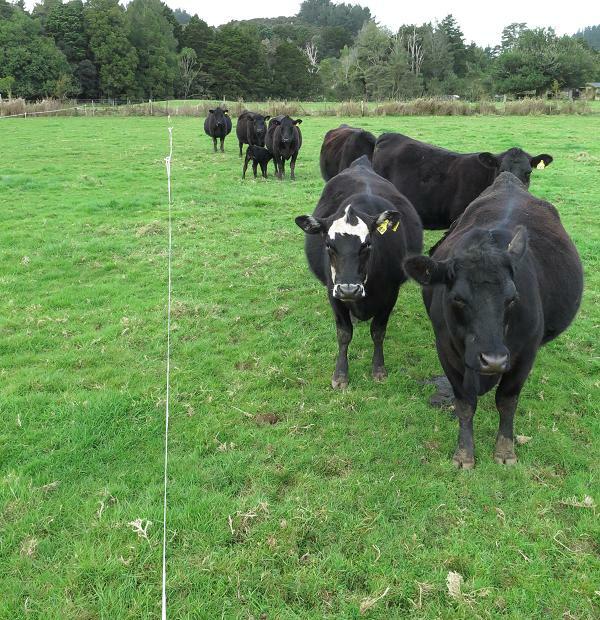 I didn't really have anywhere for the R3/4 heifers to go next, so did something we've been talking about for the last couple of weeks as I've watched the grass getting longer in the area now fenced off between the main track alongside Mushroom 1 and the stream: put up a tape, loosened the lane fence and put the heifers in to graze. It's a little area we were sorry to have to lose access to. While there was grass everywhere else in the autumn, it didn't really matter, but now it looked too useful to leave. 607 and son. 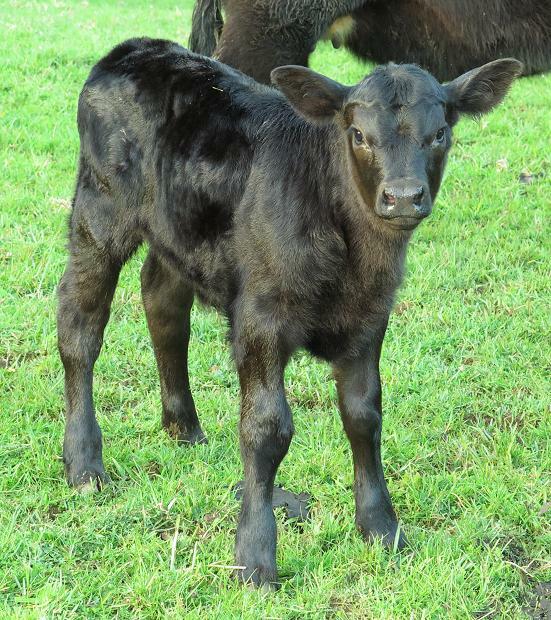 I like grey calves. 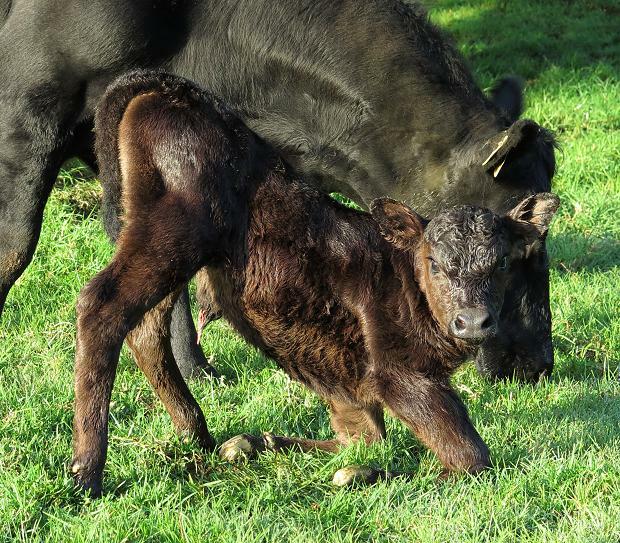 I had wondered if Curly might repeat the fabulous colour of daughter Endberly's calf last year, which indicated the presence of a colour dilution gene in their makeup of which I'd previously had no idea. This one is grey because of the Hypotrichosis defect. 613 and Demelza were out in the Frog paddock until I noticed this morning that 613 was in early labour, so brought them in to the Windmill Paddock for her to calve. She picked a spot under the trees and managed to drop the poor thing down a little bank. No wonder she looks unimpressed. 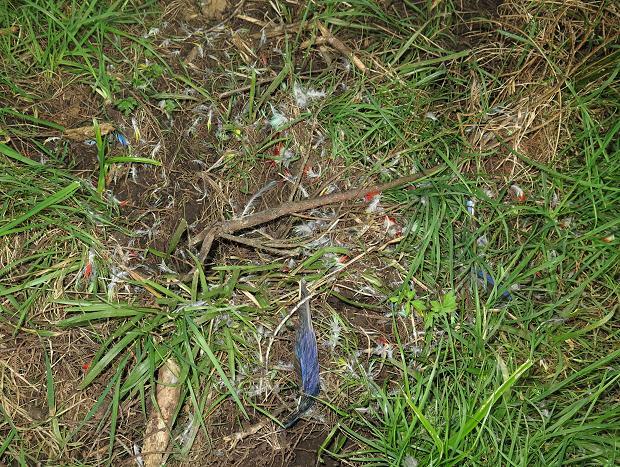 The site of the dismemberment of a Rosella is always colourful. 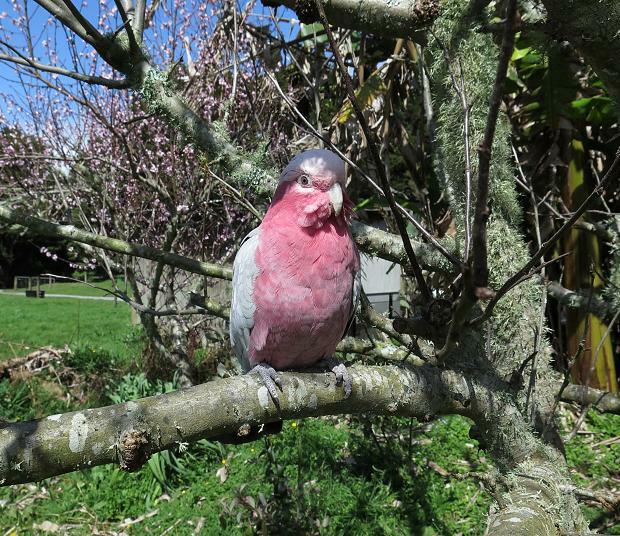 There were only two wing tips and a number of colourful feathers left of this bird under the trees in Mushroom 3. 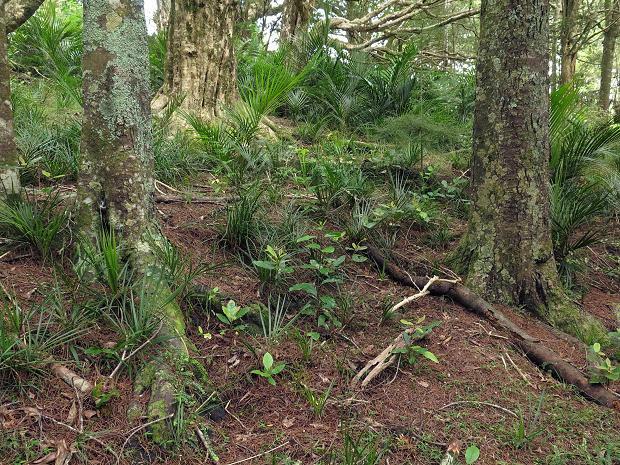 The feral pig damage of a couple of months ago is still very evident in Mushroom 2. Very irritating. Even more irritating is the evidence of fresh rooting. Night shooting now gets tricky with calving cows and calves around who'd be frightened by the noise. I did take the .22 rifle out last night, because some of the rooting is obviously being done by quite small pigs and I could shoot them with that if I saw them; I didn't. But I did get a rabbit for Stephan and one possum no longer lives. 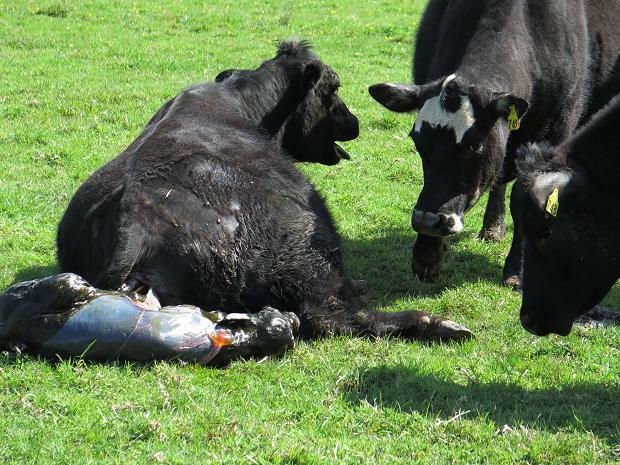 As I brought the ten R3/4 heifers along the lane, they showed great interest in the newest calf in the Windmill. Soon they'll have their own. White-faced 714 has an udder which looks like she's going to calve sooner than the 13th as I've estimated, so I brought them all in to Flat 4 for the night and will then draft out the close-to-calving ones to keep on the flats from now on. 606 produced a daughter at 6.15 this morning, just as I rode out to do my first check. Hopefully she'll be a calmer prospect than some of the others 606 has produced; as a daughter of bull 87, that is quite likely. 606 is a fierce mother! 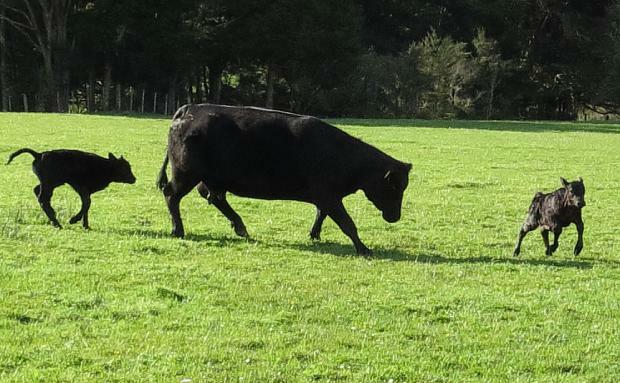 She's quite calm with me, but Eva's calf kept bouncing into proximity and was chased off repeatedly. Fortunately she's now fast and nimble and was able to keep out of the way of that fast-moving adult head; but running around when you're young is great fun, so she didn't stop doing it. 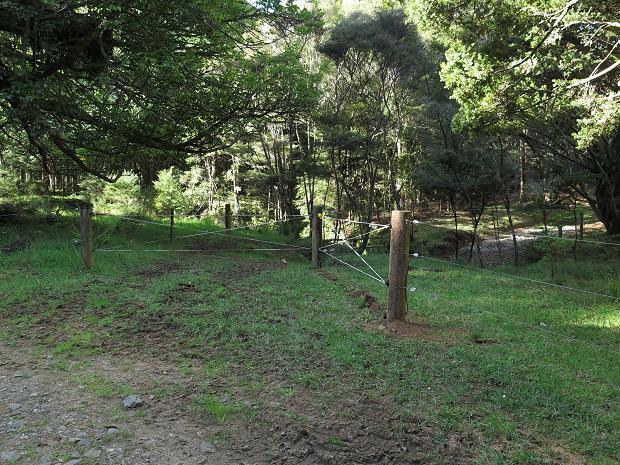 Stephan spent a couple of hours changing the lane fence to insert a tape gate to the area the heifers grazed the other day. He'll probably put a two-wire fence in along the river bank so we can use it again with ease. 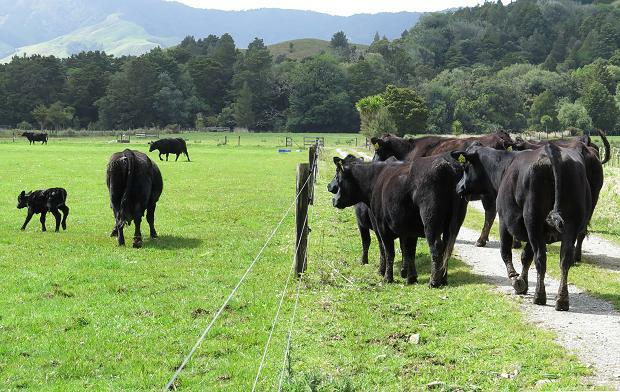 It'll never be a high-pressure stocking area, just a handy pocket for the house-cows, or a quick extra bite for a small mob when feed gets a bit short elsewhere. The Tutu plants growing along the stream banks are very pretty but almost triffid-like in their aggressive growth spurts at this time of year, especially considering their toxic nature. 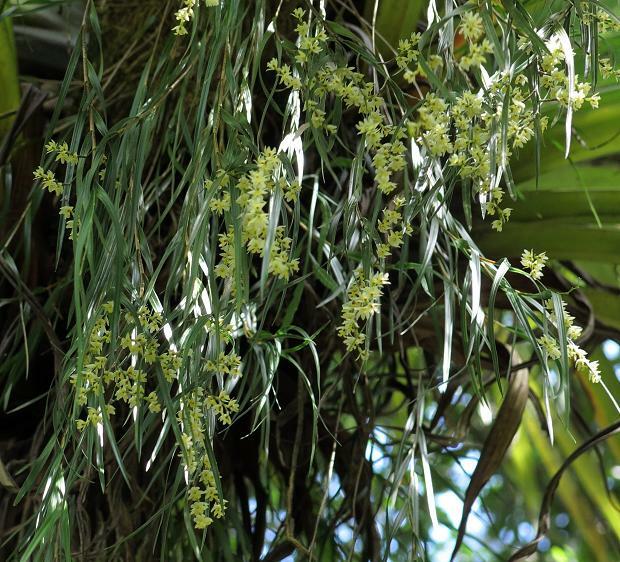 And some of the trees are festooned with tiny yellow orchid flowers. 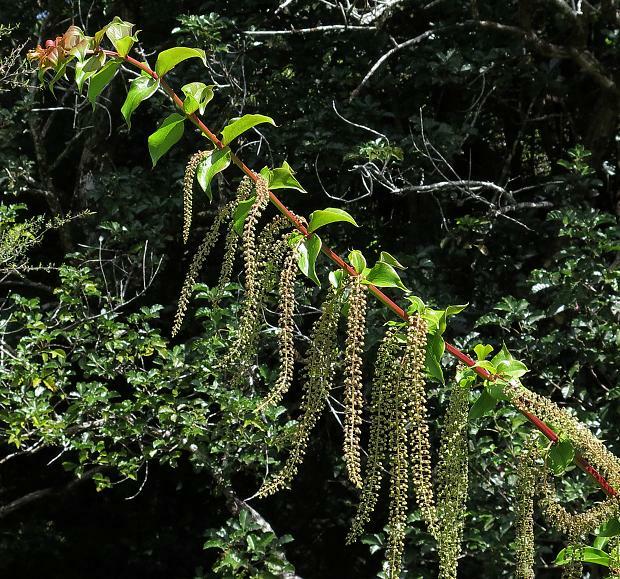 Rewarewa are also in flower, although usually so high up in the trees it's hard to see them. This one grows on a steep bank, so I could stand and look into its foliage only a little above me. Today's Photo was another of Gem's daughter. I think she looks rather like her mother and aunt when they were small.